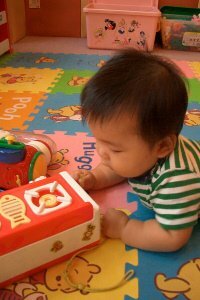 Toys can be wonderful and stimulating objects for babies that help them to learn and develop. There are so many toys on the market these days that most parents are probably overwhelmed. Almost any toy can offer a learning experience for baby, but the key is to ensure that the toys you are providing are age-appropriate. Babies develop different senses and skills at different ages, and it’s important to offer them toys that help to encourage those skills. If the toys you offer are too advanced for a baby he may become frustrated or simply show no interest. Likewise, giving an older child a toy that is not at his skill level may keep him from learning things that he should. Parents know their children better than anyone else. You know what your baby’s skill level is, what he is capable of, and what he is learning. 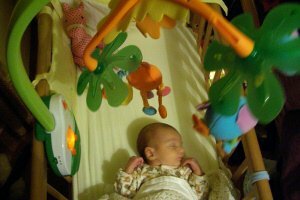 Age guides are a guideline to give you an idea of where the majority of babies are at developmentally at each age and which toys are most appropriate. Outlined below are the most age-appropriate toys for your child’s first year of life. The most basic thing to start with right when you bring your baby home is a mobile. Attaching a mobile above baby’s crib or changing table will stimulate his developing sight. Consider purchasing a mobile that has high contrast colors such as black and white instead of the soft colors that are generally used in nurseries. Also remember that newborns tend to gaze to the right the majority of the time, so be sure to hang the mobile where it can easily be seen. A CD player or iPod, while not exactly toys, are a great way to stimulate baby’s hearing during the first few months. Keep the music low; about the volume that you hear in the background of a shopping center or restaurant. Also keep the music calm and soothing to offer baby a peaceful atmosphere. It’s a good idea to also try playing the music that you played while baby was still in the womb; it has been proven that they recognize those sounds. A mirror is great for newborns and up. Babies love to look at their reflections, and at this stage they have no idea that they are looking at themselves. A baby’s favorite thing to look at is the human face. Attaching an unbreakable mirror to the inside of the crib and lying baby down in front of it gives him the opportunity to look at his own face as well as start to learn how to be comfortable while not being held. Any soft high-contrast handheld toys or cloth books are great for this age. Obviously baby does not know what they are and cannot hold them, but just studying the colors and patterns will be enough. At this age, the biggest thing to remember is that baby is going to start putting everything in his mouth. Any toys (or other things) that you give to baby or put near him must be clean and safe, since whatever he gets his hands on will inevitably go straight to his mouth. During this stage baby also finds his hands and figures out how to grasp and hold things. The same toys that you held for him earlier can now be given to him to hold and study. Also remember that most babies start rolling over and sitting up during this stage, so be careful not to leave anything nearby that could be potentially harmful. Activity centers are great for encouraging baby’s reaching and grasping abilities as well as still giving him something to look at. As time goes by baby will begin to “bat” at the toys, and you may even get some grins and giggles as he plays with it. Rattles are always a fun and easy toy for babies. They absolutely love to make noise, and getting a sound from shaking their arms is very exciting. Be sure that the rattle is lightweight and be sure to stay close by; babies don’t have the best control over their arms and will often hit themselves in the face while playing. Stuffed animals, rubber toys, and other assortments of simple toys are great for introducing babies to different textures. Offer baby a furry stuffed animal and a plastic toy at the same time and watch him explore them both. Teething toys are also appropriate for this age. Some babies begin teething at 3 months and most have started by 6 months. Be sure to purchase safe toys that are chemical free and be sure to check regularly for leaks and tears. No time is better than now to start introducing baby to books. Even though he will likely just start hitting the book, it’s a great way to instill a love of learning. Stick to small board books and cloth books. They are safe, easy to hold, and will not get ruined when baby puts them in his mouth. Keep encouraging baby’s play with stuffed animals and other soft toys. Pediatricians encourage the attachment that babies often make to these objects because they offer a sense of security and familiarity. Baby’s motor skills are developing quickly and any kind of lightweight balls are an excellent toy during this stage. Not only are baby’s fine motor skill put to work as he picks up the round, rolling object, but you can teach him to sit across from you and roll the ball back and forth. Interactive toys are now appropriate also. Baby is at a stage where he understands more and is always curious about the things around him. Toys that sing, dance, talk, and move, will be incredibly entertaining and stimulating. Every parent knows that babies would almost always rather have your belongings than their own. Your cell phone, remote controls, pans, keys, anything, offers more entertainment than any of their toys. Try putting together a box of safe household items and allowing baby to explore. Include any object that is 100% safe – the more random the assortment, the better. Major milestone at this age; baby is now mobile. From crawling to walking, baby is up and about and into everything. To encourage his walking, consider providing him with walking toys that he can push. Make sure to choose toys that are well-weighted so that baby can put his weight on them and still maintain balance. Toy phones, computers, remotes, etc. are a great way to encourage baby’s imaginative play. They love to copy what they see mom and dad do, so any toy you can offer that resembles something of your own is sure to be a hit. Shape sorters are great for working on baby’s shape recognition and comprehension. Shape sorters are also self-correcting toys. Baby will work at it until he figures out that the shapes will only fit one way. At this point baby will likely want to be outside more than anything else. Toys like shovels and pails for the sandbox, balls that they can play with, and other outdoor activities are always a good idea.